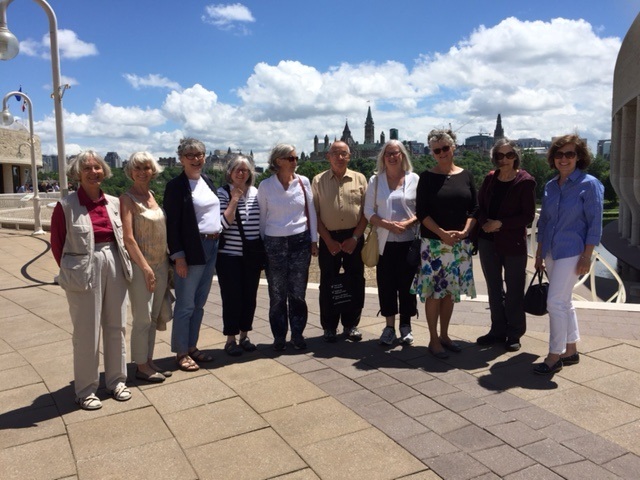 A group of OSBA Members participated in a tour of the Paper Conservatory at the Canadian Museum of History on Tuesday, June 7, 2016. Our host for this event was OSBA member Julie Hughes a recently retired Textile Conservator. Julie explained the importance of conservation and gave us an overview of the process that occurs when selecting an item for display as well as ongoing conservation efforts. Our guide for the tour escorted our group through the service corridors and explained how this part of the museum was designed. The area has special isolation rooms to ensure that contaminants are not introduced into the main collection. The hallways and loading areas were designed to accommodate large totem poles – how uniquely Canadian. At one point, we had a brief glimpse of Napoléon’s bed as it was being carefully moved on a large flat-bed trolley for the upcoming exhibit -- and yes, it was majestic. Once we arrived in the Paper Conservatory, we were introduced to Conservator Amanda who explained the importance of using archival quality materials when creating artwork. She discussed the properties of paper and environmental factors that affect the integrity of artwork such as temperature, light and humidity. Amanda then showed us a project to test the lightfastness of various media including materials commonly used in creating botanical art such as watercolour and coloured pencils. This lightfast test could easily be replicated at home and will be the subject of a future post. We then moved to another room where artwork is mounted and prepared for display. Curator Paul explained how to properly mount artwork to mat boards and where to use linen and Japanese hinging tape. He also discussed the importance of using acid-free archival quality products and protective glass/plastic. Paul then explained the optimal formula for hanging artwork -- centre of artwork should be 54” to 60” from the floor. This height focuses the viewer’s attention on the image not the patterns created by the frames. We were shown mounting hardware as well as a demonstration on how to measure and position artwork on walls. Tour participants’ questions were welcomed and some interesting information was exchanged. Paul showed us the judge's robe of Hugh Richardson who sentenced Louis Riel to death for treason on July 31, 1885. The robe is now dark green, most likely there were some fugitive colours in the original black mixture – probably a red hue. As we were finishing the tour, several OSBA members remarked how interesting being a Museum Conservator would be and what important work they do. 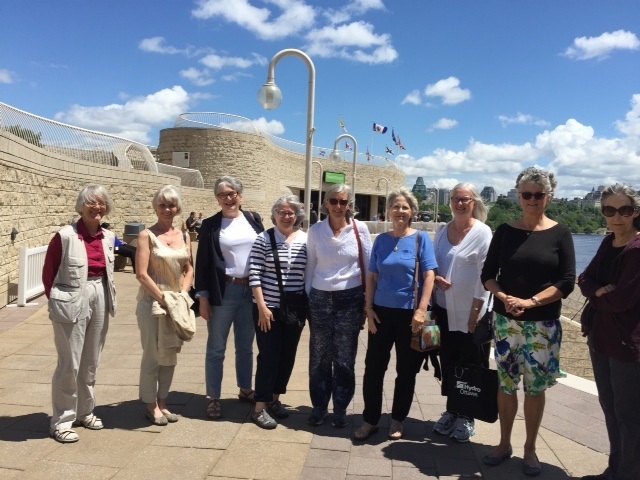 OSBA members would like to thank the Conservation Department at the Canadian Museum of History as well as OSBA member Julie Hughes for organizing this wonderful field trip.